A trip to Atlanta for the SEC Championship game was within reach for No. 18 Ole Miss, until Arkansas dimmed those chances in overtime when the Hogs converted a wild 4th-and-25 on an improbable lateral–and followed that up with a two-point conversion after the ensuing touchdown. 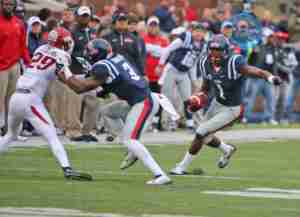 Behind the strong play of senior quarterback Brandon Allen, Arkansas (5-4, 3-2) defeated the Rebels 53-52 in overtime to throw a major roadblock in Ole Miss’ path to a possible SEC West title and a trip to Atlanta. 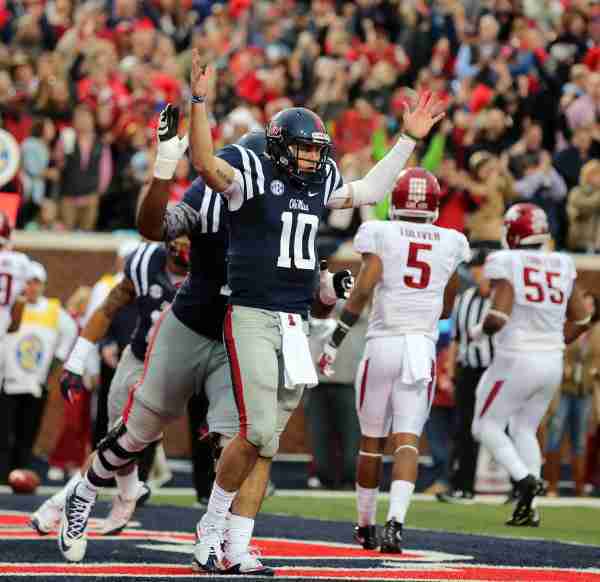 The Razorbacks gained 605 yards of total offense and took every punch the Rebels threw at them. Allen completed 33 of 45 passes for 442 yards and six touchdowns. The Rebels (7-3, 4-2) went up 45-38 late in the fourth quarter off Chad Kelly’s 18-yard touchdown pass to Quincy Adeboyejo. But Arkansas quickly tied the game up when Allen connected with wide receiver Dominique Reed for the 17-yard TD. The Razorbacks’ defense was able to get a stop, which gave the offense a chance to win the game at the end of regulation. But Ole Miss blocked Cole Hedlund’s 47-yard field goal attempt to send the game into overtime. In overtime, Kelly ran eight yards for his third rushing TD of the night to put the Rebels up 52-45, and it looked as if Ole Miss would earn its eighth win of the season and keep its hopes for an SEC West title. But the Rebels had a difficult time stopping the offensive attack of Arkansas, which ran the ball 39 times for 163 yards in addition to over four-hundred yards in the air. It was the 4th-and-25 play by the Razorbacks that was most disheartening. Allen completed a 14-yard pass to tight end Hunter Henry, who made a backward lateral which was recovered by running back Alex Collins. Collins ran it 31 yards to the Rebels’ 11, then coughed it up. Alas, it was once again recovered by Arkansas and gave the Hogs a first down. The heart-stopping turn of events leading to the first down left Ole Miss fans in disbelief. Then, Allen connected with slot receiver/tight end Drew Morgan for the 9-yard TD that put the score at 52-51, Ole Miss. But the real shock was soon to come. Bielema and staff decided to go for a two-point conversion instead of kicking the PAT. The Hogs failed on the first try, and the sold out crowd inside Vaught-Hemingway Stadium was ready to celebrate. However, the fans of the red and blue were silenced when the yellow flag hit the grass–and Ole Miss was called for a facemark on Arkansas QB Allen. The Hogs had another shot at the two-point conversion and sealed the win on the second try with the run in by Allen. This SEC fistfight that Freeze predicted lived up to its expectations with both programs pulling out magical tricks on offense. Arkansas struck first on the scoreboard with the 31-yard catch from Morgan, who had a team-high nine catches for 122 yards. The Rebels quickly responded with a 3-yard TD run by senior running back Jaylen Walton. Kelly’s 19-yard run and his 21-yard pass to tight end Evan Engram were the two plays that placed Ole Miss in great position to even the score. However, in a see-saw battle, the Razorbacks quickly answered the Rebels’ first TD score. Allen connected with Jared Cornelius for 21 yards to the Rebels’ 15 to set up Allen’s next pass to Reed, who was left wide open in the back of the end zone for the 15-yard score. It was 14-7 Arkansas and the offensive line for the Razorbacks gave Allen a lot of time inside the pocket. However, if he had to make plays outside of the pocket, he was able to do that also. On the second scoring drive, Allen was running to the sideline looking down field, only to find Reed for the 24-yard reception. But Allen wasn’t the only quarterback on the field making plays for his offense. Kelly made plays with his feet and his arm. 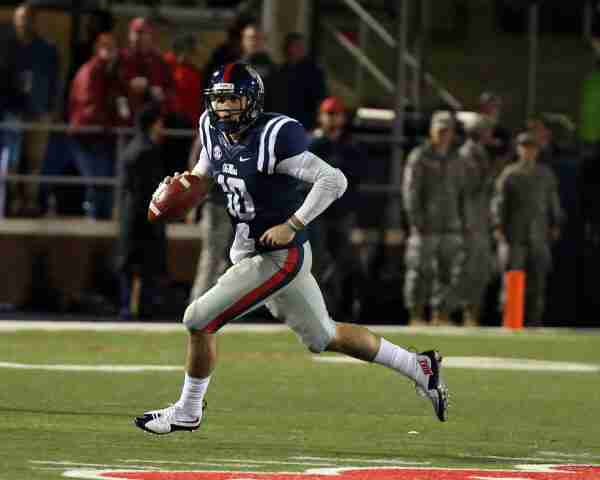 The Ole Miss quarterback ran for 11 yards into the end zone to even the score at 14. Before the score, Kelly had completed back-to-back passes to Markell Pack, then to Cody Core and Laquon Treadwell for seven and 10 yards, respectively. Kelly finished the game as Ole Miss’ leading rusher with 11 carries for 117 yards and three touchdowns. He was 24 of 34 for 368 yards through the air, also with three touchdowns. Arkansas went back up 17-14 following a 45-yard field goal by Hedlund. Then, the Rebels’ kicker Gary Wunderlich answered the bell with the 37-yard field goal to even the score at 17 before the break. Our plan was not very good. The number of big plays we gave up was disheartening. We certainly did not play well. Next Up: The Rebels have a bye week and then face the LSU Tigers in Vaught-Hemingway in another pivotal SEC contest.